Who is vulnerable to BDS? 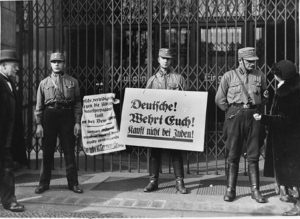 Early attempts to boycott Jews didn’t end well. While reviewing some of the recent resounding failures of the movement to Boycott, Divest from and Sanction Israel I pondered why this vile movement has gained so little traction. Beyond the obvious point that most of the Western world understands that it’s wrong to boycott Jews, the answer is that many of the products and services that Israel provides are ones that few would be willing to forgo. Individuals are unwilling to give up the advantages of Israeli high tech. Governments don’t want to lose Israeli expertise in fighting terror. Patients don’t want to pay inflated prices when they can buy top quality Israeli medicines. If the BDS warriors think they can seriously damage Israel’s economy they are dead wrong. But there’s one group of Israeli business that are more susceptible to this evil scheme. Small businesses producing non-essential products can be damaged by attempts to boycott Israel. 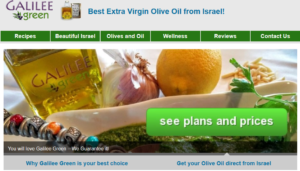 “Israeli businesses in the Jordan Valley who sell dates are losing contracts and are looking to expand markets to regions not interested in the politics, the BDS can appear in Seattle and block a shipment of Israeli goods from coming in, they put pressure on musicians coming to Israel, as well as label tomatoes in the market and pressure them off the market,” reports Gedaliah Blum, who runs an organization devoted to helping vulnerable small businesses fight back. This blog is dedicated to helping advocates for Israel to be more effective. I’m going to suggest a practical step every supporter of Israel take; select an Israeli small business to promote. I’m kicking off with my longtime friends Shmuel and Chana Veffer who run a thriving business producing one of the products the Bible praises the land of Israel for, high quality olive oil. It’s a great product and they are great people. Give them a try and give your personal answer to the BDSers. Do you have your own favorite Israeli small business you would like to promote? Please link to it in the comments below this post.